Default channel groupings in Google Analytics is what you call the different traffic sources in your Google Analytics account. They are comprised of Organic Traffic, Direct Traffic, Social Traffic, Referral Traffic, Email Traffic, Paid Traffic, Display Traffic, and the Others Traffic. Depending on your website’s traffic, these default channel groupings might not appear in your reports. For example, here’s a screenshot for one Google Analytics account. You’ll notice that there is no Display Traffic or the other channel groupings from Google. This simplifies what you see in the reports so you can focus on the things that matter the most — the kind of traffic that you already have instead of what you don’t have. Organic traffic is the kind of traffic that comes from search engines. When people search something on Google (or Bing, or any other search engine), a list of websites show up. When people click on one of these results, that visit is counted in the organic traffic of that website. It is the best, most sought-after traffic by marketers. It’s the main reason why content marketing is on the rise today. The results of organic traffic is exponential. When marketers talk about SEO, it’s all about increasing the website’s organic traffic. Just remember that SEO is not static. No matter how optimized your website is, if you don’t create and distribute content, you will never rank high on Google and other search engines. Example: Jon searches in Google for the keyword “email marketing statistics 2018.” He sees the results of his search. He clicks on one of the results and your website page on Email Marketing Statistics 2018 loads. Direct traffic is the kind of traffic that comes from people directly typing or entering your website’s URL on their browsers. It’s usually an indication of brand awareness or repeat visits. After all, it’s highly unlikely that you visit a website by typing a URL if you haven’t heard of the brand somewhere else, or know it’s URL for that matter. From the user’s perspective, direct traffic usually comes from bookmarks or autocomplete in the URL — which is similar to typing it directly. The only difference is that you have a little help from your browser. Example: Jon realizes that Christmas is around the corner. He opens up Safari and starts typing “amaz” then the browser autocompletes the URL to amazon.com. He hits enter and Amazon’s website shows up. There’s also another instance where direct traffic might increase without being the result of people typing directly your website. It involves the transfer of traffic from a secured site (https) to an unsecured site (http). Example: Jon is browsing this particular page. Then he clicks on a link to http://domain.com. Since my website is secured and the target site is not, GA will count Jon’s visit as direct traffic instead of referral (see referral traffic below). Social traffic is the kind of traffic that comes from social networks. This happens when people share a link on Facebook, Twitter, Instagram, etc. and you click on it. Example: Jon is scrolling on Facebook and sees a Tasty video about pasta cooked 4 ways. He’s sees how it’s made and thinks to himself, “I can do that.” He clicks on the link in the post to see the full recipe. Tasty’s website loads with the specific recipe for that video. Referral traffic is the kind of traffic that comes from other websites. If done right, this is the result of effective content marketing. What happens is other people/organizations write about you/your products/services on their own websites. Since they have their own audience, when they click on that link, they land on your own website. Google Analytics counts that as referral traffic. The website that links to your site is called the referring website/domain. Example: Jon is reading an article from wistia.com. He reads an interesting statistics saying that by 2019, video content will comprise of 80% of all consumer internet traffic. He noticed the link, so he clicks on this and lands on another website (smallbiztrends.com). From smallbiztrends.com’s analytics account, Jon’s visit is counted in their referral traffic. The referring website/URL/domain is wistia.com. Email traffic is the kind of traffic that comes from your email campaigns. If neither one of those two options are met, GA will count that link click (visit to your website) under direct traffic. Example: Jon received two emails from Lazada. Email 1 contains an announcement for a sale coming up. It is sent via their email marketing software. Jon clicks on the link and lands on the website. GA counts this as email traffic. Email 2 was sent by a customer representative about a complaint he had. The email linked to the terms and conditions page. Since the email was manually sent and no UTM parameters were added, this traffic is counted as direct traffic. Paid traffic is the kind of traffic that comes from paid advertisements. These are ads from Google Ads or Bing Ads. To be more specific, links with the medium “ppc” or “cpc” (or the ones indicated in the table above) are the ones tracked. You can customize this, along with other settings, in the admin settings of your Google Analytics account. You can find out more information about how to do this in my previous post about paid traffic. 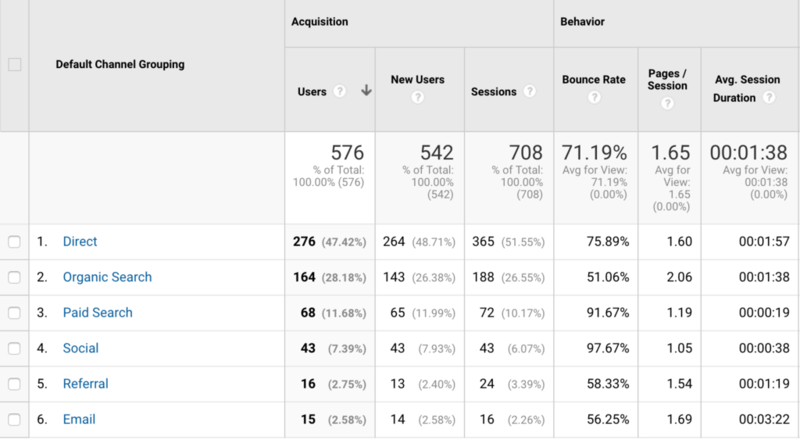 Refer to the table above to see which parameters direct traffic is counted in your GA account. Others traffic is the kind of traffic that comes from traffic that doesn’t fall under the default channel grouping definitions. This usually happens when you use custom parameters (UTM tags) in the links that you share. For example, if you added “facebook” in the medium parameter, this will show up in the Others traffic. For it to appear under Social traffic, you either have to add the value of “social” in the medium parameter. You can learn more about UTM tags here. Here’s a final note the default channel grouping in Google Analytics. You can change the rules that govern the way traffic is grouped into these buckets in the admin section of your Google Analytics account. One popular use case for changing the default channel groupings is to separate the traffic coming from advertisements on social from the traffic coming from ads via search. Do you have questions about the default channel groupings? Are you using custom rules to modify how your reporting looks like? Let me know in the comments below!